When your business needs insight and innovation, you need DXP. We have extensive experience in the design, engineering, manufacturing, fabrication and servicing of rotating equipment, pumps and packaged systems. Every day, we engineer customized solutions for a vast array of oil, gas, power, mining, water and air applications. 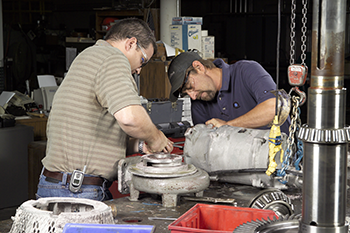 Our employees deliver these services while providing first-class in-house and field service to maintain the products we sell and systems we engineer. Using state-of-the-art equipment produced by the world’s top equipment manufacturers, our experts couple engineering and mechanical expertise with system flow know-how to develop innovative solutions for industrial, commercial and municipal customers worldwide. In addition, we periodically invite our clients to industry focused training seminars coined DXP University, which offers in-depth presentations on a variety of topics including basic and advanced hydraulics, pump troubleshooting, pump selection for industry applications, sealing technologies, variable frequency drives and a variety of other topics related to rotating equipment. Onsite, project and equipment specific training is available as well. We are innovators who believe people come first - employees, customers and suppliers. For more information about DXP's capabilities, contact DXPE.com.